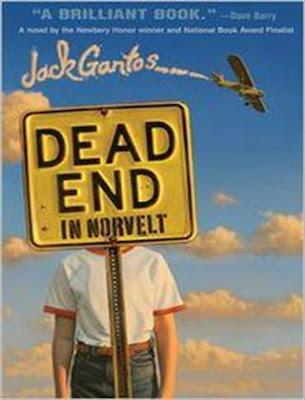 Dead End in Norvelt by Jack Gantos is the winner of the 2012 Newbery Medal for the year's best contribution to children's literature and the Scott O'Dell Award for Historical Fiction. It’s a great read for guys, but girls will love it too. Dead End in Norvelt is an entirely true and wildly fictional novel. The story takes place during an incredible two months for a kid named Jack Gantos, who had plans for an exciting vacation but ends up "grounded for life" by his parents. Although poor Jack’s nose discharges blood badly at every little shock he gets, there is plenty of excitement and shocks coming Jack's way once his mom loans him out to help a feisty old neighbor with a most unusual chore: typing obituaries filled with stories about the people who founded this model town. As one obituary leads to another, Jack is launched on a strange adventure involving molten wax, Eleanor Roosevelt, twisted promises, a homemade airplane, Girl Scout cookies, a man on a tricycle, a dancing plague, voices from the past, Hells Angels, and possibly a murder. This book is full of endless surprises. Gutman is at his best with his sly, sharp-edged narrative of growing up in slightly off-kilter, small-town America where the past is present, the present is confusing, and the future is completely unknown.